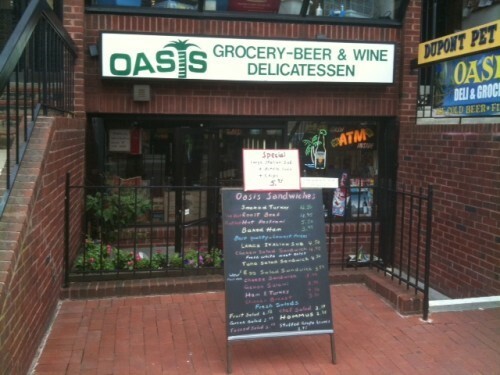 Beer and Welding’s sandwich board outside Oasis grocery, Washington, DC. The country’s largest Ethiopian community. The second largest concentration of Salvadorans in the U.S. The demographic details about the Washington metro area don’t square with the popular image. Washington had always attracted immigrants, but in the past, the settlers were small in number, relatively select, and barely visible. Foreigners were mostly students, embassy retainers, and affluent professionals. Now, Washington has not only become an immigrant city, but also a distinctive one. Unlike old immigrant towns, such as New York and Chicago, with their neighborhoods of people from Southern and Eastern European backgrounds, Washington is strikingly a haven for Third World newcomers. Metro Washington may not have a Hungarian restaurant, but it does have a score of Peruvian ones. The food mirrored the atmosphere. A few swank, French outlets like the Sans Souci catered to Washington’s political and social classes. The sports crowd and city insiders congregated at the Connecticut Avenue restaurant, Duke Zeibert’s, which my father, an inveterate New Yorker, called a “poor man’s Toots Shor’s.” Baskets of onion rolls on the tables reflected the owner’s Jewish origins. The kitchen turned out chicken in the pot and, sometimes, matzoh ball soup. However, Washington could not boast a Lindy’s, Nathan’s, or a Luchow’s, culinary monuments of my father’s days in the Empire City. More typical were southern-style lunchrooms and cafeterias. Sholl’s was a chain of cafeterias where ordinary government and office workers were offered breakfast, lunch, and dinner meals at rock bottom prices. The business, whose K Street location I frequented when I taught evening classes across the street, was founded by Evan H. Sholl, who grew up on a Pennsylvania farm. The entrepreneur, a man of strong religious conviction, established his first eatery in the late twenties, at the end of the Coolidge administration. Sholl’s shops served up hearty comfort food, daily specials like veal cutlet with tomato sauce and liver with onions. The dining tables were adorned with prayer cards. Its breakfasts were popular with Harry Truman, a country boy like Mr. Sholl. In this “white bread” era, unusual ethnic restaurants stood out. Going with friends to the Omega, a Cuban restaurant on Columbia Road, had all the elements of an exotic excursion. The menu highlighted such Spanish specialties as paella and mariscada (seafood stew), along with such Cuban standards as ropa viella (“old clothes”), shredded beef. Like many such early Latin places, its dishes spanned the Americas. I hungered for their chicken enchiladas with a large helping of black beans and rice. The legend that the Bay of Pigs invasion was plotted there accentuated the Omega’s appeal. The Omega was the first in a parade of Hispanic restaurants that opened their doors to curious Washingtonians. The El Caribe and El Dorado, both pan-Latin spots, also set up on Columbia Road. Not far away, in 1973, the Churreria Madrid began selling churros, Spain’s popular twisted crullers, and making gazpacho on weekends. Other Latin outposts are etched in my memory: Pancho’s, a Mount Pleasant night club with a rollicking mariachi band; Carlos Gardel, a bar owned by an Argentinian, where you ate empanadas in the balconies and reveled in the dance music pounded out by the band below. A nearby Cuban luncheonette, whose name I have forgotten, served media noche, the crusty sandwich of pork and melted cheese, and batidos, drinks made from soursop, mango, and other tropical fruits. A visit to the Calvert Café, a pioneering Middle Eastern eatery, was another adventure. Mama Ayesha, a Palestinian woman who was the room’s guiding spirit, prepared grape leaves at a corner table. Before it became a full-fledged restaurant, the café’s bar enticed drinkers with what were then unusual appetizers—hummus and baba ghanouj. There were few ethnic food groceries in the early days. Skenderis, a Greek grocery near Dupont Circle, was a haunt of mine. In the cluttered upstairs space, Dino Skenderis started a gift shop which rode the Greek shoulder bag craze during the sixties. It blossomed into a purveyor of feta cheese, olives, nuts, dried fruit, and similar items. Dino carried what was then an unfamiliar product, Colombo Yogurt. I was to learn later and to write about the story of this product. Colombo, the country’s first commercial yogurt, was begun by an Armenian family in Massachusetts, the Colombosians. As the years passed, I uncovered other hidden eateries. The Islander was one of the most memorable. The Trinidadian restaurant, then mostly a carryout near Georgia Avenue, was presided over by Addie Green, a proud, voluble woman. On special occasions, she wore a colorful turban. Addie initiated me into the culture and lore of her land and her food, a mixture of Indian, African, French, and Spanish influences. I tucked into many a curry with rice and peas and savored drinks like mauby, a slightly bitter drink made from the bark of a Caribbean tree. The Islander was one of the most colorful of the many Caribbean restaurants in the 1980s that the Washington Post Magazine highlighted in a cover article. Salvadoran restaurants began to emerge as Central Americans flocked to Washington, lured by the magnet of the “capital” city and a host of laboring jobs in hotels, restaurants, and office buildings. Many of the early arrivals hailed from a single town, the small community of Intipuca, which flourished with funds sent back by the newcomers. Visitors to a Salvadoran restaurant encountered such revelations as the pupusa, the country’s variation on the tortilla, and marañon, a drink made from the cashew fruit. Washington was gradually transforming from a sleepy southern town to a polyglot capital. I searched out novel eateries and wrote stories about my discoveries in a column for the Washington newspaper, The InTowner. One of the early pieces I did in my column, “The Ethnic Bazaar,” was about the Happy Inn, an Indonesian-Chinese eatery in the Cleveland Park neighborhood. It was owned by Eric C.C. Lin, a man of Chinese ancestry who grew up in Indonesia and studied atmospheric physics at Peking University. My wife Peggy and I spent many an evening there. Oseng-oseng, a dish of tiny shrimp stir fried with tempe and green beans in a heavy soy-based sauce ignited with chilis, was a passion of ours. I loved the ring of Indonesia’s culinary language, of words like nasi goreng, gado gado, and rendang. Immigrant communities, which might have first arisen in the city, now began taking root in the suburbs. Restaurants serving these groups followed. My forays in quest of ethnic food soon required Metro rides from my home in the Adams-Morgan area to far-flung neighborhoods. I was excited by Jamaica Joe, a lunch room in a small Silver Spring, Maryland shopping center, which served up “curry goat,” one of the country’s national dishes. A long train ride to Ballston, an Arlington neighborhood, took me to the Pakistani café, Ravi Kabob, one of the many kebab joints that would mushroom in the suburbs. I was drawn by chicken tikka, nicely charred on the outside and moist on the inside and served with a spicy stew of chickpeas, nan, a piping hot thick bread, and coriander chutney. I washed the meal down with a creamy lassi, the traditional yogurt refreshment. Photo courtesy of Bistro Bohem, Washington, DC. array of choices: Afghani, Persian, Yemeni, Egyptian, Guatemalan. Because of the large influx of Bolivians to northern Virginia, Washington can claim America’s largest enclave of these ethnics. Meanwhile, in the city, dining rooms have sprung up to serve once uncommon cuisines. Domku in the Petworth neighborhood near Georgia Avenue features Polish and Scandinavian dishes. A Czech bistro (Bistro Bohem) in the once unfashionable northwest Bloomingdale section has won a strong following. Near Dupont Circle, a long-standing convenience store, the Oasis, is now selling sandwiches created by the operators of a food truck. A young, very affable Salvadoran woman prepares the food in the back of the shop owned by a Persian gentleman. One sunny afternoon at an outside table I enjoyed an El Porco sandwich from the intriguingly named Beer and Welding operation. The sandwich brought together pork shoulder flavored with garlic aioli, pickled spring onions, and ramps with swiss cheese and mixed greens. A Brazilian woman, who worked at a salon next door, sat next to me. We compared notes. I savored the food and mused about Washington’s changing ethnic landscape. Peppers grilling at Beer and Welding sandwich shop, Washington, DC. Editor’s Note: This is a guest blog posting from Joel Denker, a historian of ethnic foodways in the United States who has lived in and written about the changing ethnic foods in Washington D.C. He is author of, among many other things, “The World on a Plate: A Tour through the History of America’s Ethnic Cuisine,” (2003, Westview). Denker’s food writings appear on his website, www.foodpassages.com. This is the first in what we hope is a series of postings about the foodways of the D.C. area in anticipation of the upcoming AAA annual meetings. We would love to hear from more scholars with reflections on food and the D.C. area in coming weeks. I arrived in DC in 1976. Omitted from the article was Thai Food. The Thai Room had a downtown location and then opened at Connecticut and Nebraska Aves, NW. In those early days it was quite good and even expanded after consolidating to the one locale in upper NW. Eventually its food declined, and many other Thai restaurants surpassed it. It’s long gone, but Thai food is widely available in a range of qualities from mediocre to quite good and includes at least one place where the chef/owner fixes a prix fixe meal based on what was good that day in the markets tempered only by dinners’ food allergies. There was also one incredible, authentic full range Japanese restaurant on Georgia Avenue almost at the District line. It served everything from congealed soup (almost impossible to find now) to sushi. Alas, it is also long gone and not really replaced despite the large number of pretty good Japanese restaurants and my favorite place for sushi Takibana in McLean.